Autumn Lawn Care Tips | Santa Barbara Landscaping Company | Down to Earth Landscaping Inc. In our previous blog, we talked about how autumn is the perfect time to create a checklist for “winterizing” your Santa Barbara gardens. As a part of your landscape maintenance education, it is important to know about lawn care during the autumn season. This is often called lawn thinning. De-thatching refers to a process of removing dead grass in a lawn. A certain amount of thatch protects the roots, but excessive amounts negatively affect the health of the lawn. This is necessary because dethatching encourages the flow of nutrients and oxygen to the lawn. 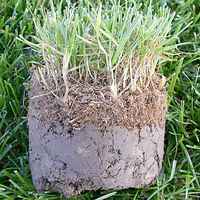 Regular dethatching forces buds to grow near the base of the grass stems, preventing the grass plants from being dead underneath and only green on top. Thatching frees new grass shoots to grow in thick and lush. Think of it as a body cleanse for your lawn. It balances the lawn’s chemistry. There are a couple of ways to do it. Thatching Rake: For small lawns or thatch less than 1 inch thick, consider removing thatch with a rake. Manually dethatching causes the least amount of stress to a lawn. A rake with hard tines may or may not work effectively to pull thatch to the soil surface. A specialized dethatching rake has sharpened tines designed to lift thatch away from soil. With a dethatching rake, use the same motion as with a traditional rake, allowing tines to dig into thatch and pulling it upward to loosen and lift thatch. Done correctly, you should feel the thatch separating from soil and see it being lifted. has vertical blades or rigid wire tines that slice into thatch and lift it to the lawn surface. Usually you want blades to cut no deeper than 1/2 inch into soil, if at all. Dethatching equipment can often be rented from lawn equipment rental companies. A dethatcher is a large, heavy machine that requires some muscle to maneuver. You’ll need a truck to transport it and more than one person to load and unload it, so I’d suggest hiring a professional to take care of this for you. Use lawn mower to lower lawn height—In order to completely remove the thatch, it is important to mow what is left of the thatch almost to the ground. Giving the lawn a “Flat top hair cut” helps to complete this process. Rake lawn with leaf rakes. This is done to clear away old lawn material so the new lawn can grow. Dispose of debris. Dead lawn material cannot be used as mulch. It is best to dispose of it. After dethatching, fertilize the lawn with a nitrogen fertilizer to stimulate re-growth. Aeration is the removal of soil plugs that will leave your lawn looking like you have rabbit problems. Aeration, besides removing thatch, offers the added benefits of reducing soil compaction and opening up channels in the soil for water infiltration and gas exchange. Renting aeration equipment is much easier; they simply go by the name aerators. The best time of the year to do aerating is in the fall of the year. Over seed lawn with Annual Rye lawn seed. Annual Rye is inexpensive and fast germinating and will stay green through the winter to keep your lawn green all winter until your renovated lawn can come back to life. Rake seed in. This will allow for even distribution of the seed. Option – top-dress seed with seed cover (topper-mulch). This seed cover will warm the seeds and release nutrients into the soil as it slowly feeds the germinating seed. Follow these tips and come spring you will have a healthy, green lawn. And remember, we are always available to help.